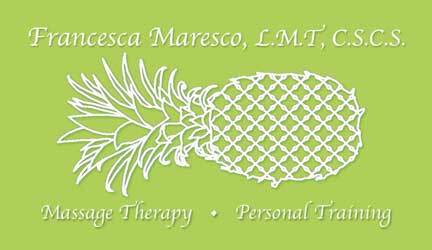 Francesca is a Licensed Massage Therapist in the state of Hawaii and New York and a NSCA Certified Strength and Conditioning Specialist. A graduate from the world renowned Swedish Institute in New York City, she currently resides and operates her private practice in Wailuku, Hawaii where she makes house calls specializing in therapeutic Swedish massage and exercise science. Fran also offers therapeutic Deep Tissue massage, Myofascial Release, Five Element Shiatsu, Sports massage and Reflexology. Before falling in love with Massage Therapy, Fran studied ceramic sculpture and Industrial Design at Pratt Institute in Brooklyn, NY and the University of Massachusetts at Dartmouth.